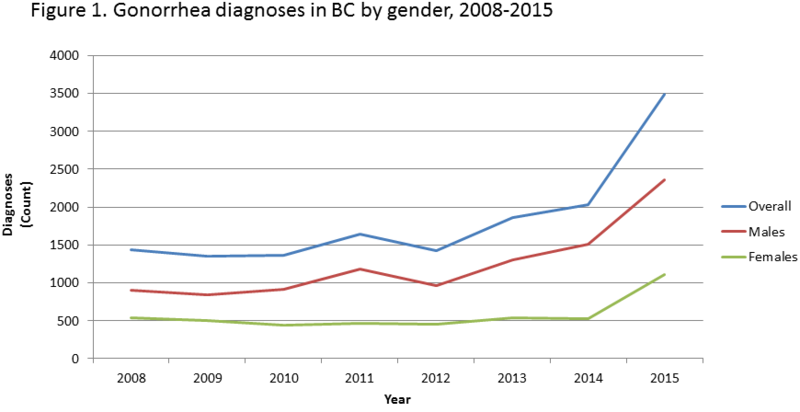 In British Columbia (BC), there has been a steady increase in reported gonococcal (GC) infections since 1998. Most notably, there was a 70% increase in GC infections in 2015 (3,160 cases) compared with 2014 (1,803 cases). In 2015, the increase was observed among both males and females (Figure 1), in all age groups, and across all health authorities. Recommended treatment for GC infection involves dual therapy: a third generation cephalosporin (cefixime 800 mg PO in a single dose or ceftriaxone 250 mg IM in a single dose) along with a second agent (azithromycin 1 g PO in a single dose or doxycycline 100 mg PO bid for 7 days). The BC Centre for Disease Control (BCCDC) Public Health Laboratory’s (PHL) Public Health Advanced Bacteriology and Mycology program routinely performs antimicrobial susceptibilities of Neisseria gonorrhoeae (N. gonorrhoeae) positive isolates for a panel of antimicrobial agents that include ceftriaxone, cefixime, and azithromycin. The BCCDC PHL participates in proficiency through the National Gonococcal Antimicrobial Comparison Program. The minimum inhibitory concentration (MIC), the lowest concentration of antibiotic required to inhibit N. gonorrhoeae growth, is used to assess antimicrobial susceptibility. Between 2006 and 2015, 0.5% (21/4,180) of isolates showed an MIC ≥ 0.25 µg/mL to cefixime. No isolate was fully resistant to cefixime or ceftriaxone and no treatment failures were reported in BC during this period. However, an increasing trend in percentage of isolates with elevated MIC (i.e., reduced susceptibility) to cefixime or ceftriaxone was observed in 2006-2010. Similarly, an increasing trend in percentage of isolates with elevated MIC to azithromycin was observed in 2006-2011. These trends have since reversed (Figure 2). Decreasing trends in the percentage of isolates with elevated MIC to cefixime or ceftriaxone were observed in 2011-2015. Similarly, the percentage of isolates with elevated MIC to azithromycin also reversed in 2012-2015. The decline in reduced susceptibility to cefixime or ceftriaxone observed between 2011-2015 is encouraging. This trend may be due to population-level replacement of resistant strains with more susceptible strains, as well as changes in the Canadian and provincial gonorrhea treatment guidelines to more effective regimens (i.e., increased cefixime dosage, dual therapy, or improved medication adherence due to single dosage). These trends will be closely monitored to inform the future evolution of gonorrhea treatment recommendations. The continued threat of emerging resistance reinforces the need for STI prevention and control measures such as increased testing for gonorrhea, partner testing and treatment of gonorrhea, and tests of cure, as well as the need for antibiotic stewardship to ensure effective treatments for bacterial infections.